This brilliant yellow Floribunda is a vigorous grower, fragrant and thornless - a gardeners delight. Incredibly it was bred in the UK in 1979, the same year that Amanda was born. 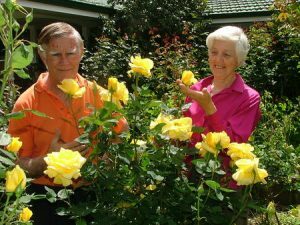 Thanks to the generosity of the Blackwell family of Toodyay six Amanda roses were imported to Western Australia in 1998 and they spent nine months in quarantine. They hold a special place in Amanda's Garden. Our grateful thanks also to Ian Dawson of Dawson's Garden World who kindly provides a supply of Amanda Roses for sale at the Garden Fete in October each year. The roses are sold each year at the Annual October Garden Fete held at Amanda's Garden 1520 Matison St Southern River WA 6110 - see Events page for full details and dates each year.